[CIVIL WAR]. Partially Printed Document Signed by James M. Smith, countersigned by Jerome B. Parmenter, and Captain Joseph H. Allen. Richmond, Virginia, October 18, 1864. 1 p., 8 x 12½ in. With printed envelope restating affidavit’s claim on the outside. On April 21, 1864, the New York State Legislature passed “An Act to enable the qualified electors of this State, absent therefrom in the Military Services of the United States, in the Army and Navy thereof to vote.” Each soldier and sailor needed to select someone at home who could cast his ballot for him. 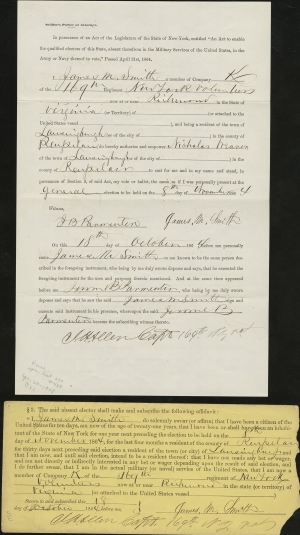 In this Soldier’s Power of Attorney, James M. Smith of the 169th New York Volunteer Infantry authorized Nicholas Weaver to vote on his behalf in Lansingburgh, New York, in the 1864 election. In mid-October 1864, when Smith signed this document, the 169th New York was in the trenches before Richmond, Virginia. Three weeks earlier, the regiment had suffered 21 casualties at the Battle of Chaffin’s Farm. A few weeks after the election, the 169th New York left on an expedition to Fort Fisher, which led to its capture in mid-January 1865. Republican President Abraham Lincoln was running for reelection against his former general, Democrat George B. McClellan, who was widely considered the favorite among his former troops. Instead, Union soldiers such as Smith voted for their commander in chief in great numbers, reelecting Lincoln using proxy voters like Weaver. Although no statistics exist for soldiers who went home to vote or voted by proxy as Smith did, those 40,000 soldiers who voted in the field gave 75 percent of their votes to Lincoln. He won reelection by more than 400,000 popular votes and by an overwhelming 212 to 21 vote in the electoral college. James M. Smith (b. c. 1820) was born in Essex County, New York, and enlisted on August 28, 1862, at Lansingburgh, New York, as a private in Company K of the 169th New York Volunteer Infantry. He was promoted to chief bugler on April 28, 1864, and was mustered out with his regiment at Raleigh, North Carolina, in July 1865. A month earlier, he is listed on the census of Lansingburgh, with his wife Elizabeth, three of their children, and his mother. His profession was listed as “soldier,” and he lived next door to Nicholas Weaver and his family. By 1870, his wife and three children still lived next door to the Weavers, but James M. Smith was not present. Nicholas Weaver (1798-1878) served as the president of the village of Lansingburgh, New York, in 1840 and 1842. In 1865, he was a river captain in Lansingburgh, where he lived with his second wife Phoebe Homan and four of their eight children, next door to James M. Smith and his family. Jerome B. Parmenter (1838-1910) graduated from Union College in 1857. He studied law and was admitted to the bar in 1859. Parmenter mustered in as a 1st lieutenant in Company A of the 169th New York Volunteer Infantry in August 1862. He became captain of Company I on December 31, 1862. On December 2, 1863, he was discharged for disability and returned to his law practice. Because Parmenter filled in and witnessed this power of attorney form, he may have been revisiting his old regiment for the purpose of gathering such documents to return to Rensselaer County in time for the election. In 1868, he bought a half-interest in the Troy Press newspaper, for which he served as editor until the 1880s. By 1890, he lived in Bennington, Vermont.